I've heard people who have been stung by a Bald-faced Hornet (Dolichovespula maculata) describe the painful experience as like being hit by a bullet. I don't know if this is accurate because the comparison has come from people who I know have never been shot. I've never been shot, but I have been stung by a bald-face hornet. It hurts ... bad! Maybe it does feel like being hit by a bullet but I never want to test the comparison. 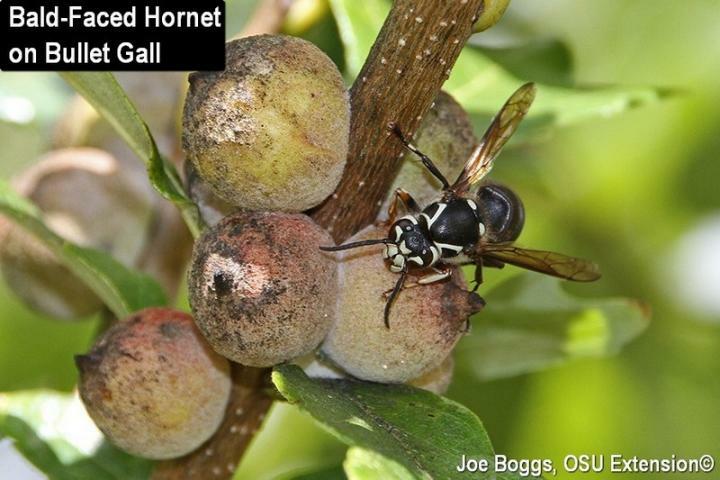 Participants in the 84th Ohio Plant Diagnostic Workshop held this past Friday in the OSU OARDC Secrest Arboretum braved experiencing possible bullet-like stings to view numerous bald-faced hornets buzzing Oak Bullet Galls. The galls were also drawing the attention of a few other wasps such as yellowjackets (Vespula spp. and Dolichovespula spp.) as well as some flies and ants. Of course, the question on everyone's mind was why were these insects being drawn to the galls? Oak bullet galls arise from twigs and branches. They are produced under the direction of several species of cynipid wasps (family Cynipidae) in the genus Disholcaspis; thus, there are several types of bullet galls. All are more or less rounded and measure about 1/2" in diameter. Colors vary from light green, to reddish-green, to light brown. Some bullet galls are covered in very fine, short hairs, while others are completely smooth. They cause no appreciable harm to their oak hosts because they do not disrupt vascular flow. Gall formation involves an intricate and fascinating interaction between the "gall-maker" and its host plant. As with all galls produced by wasps, midge flies, and other insects, the gall-maker uses various chemicals to turn plant genes on and off at just the right time to induce and direct gall formation. Thus far, no researcher has ever duplicated this interaction without the services of an insect gall-maker. Many bullet galls include extrafloral nectaries (a plant organ) in their gall structure. I find this to be incredible, but it's not unique to bullet galls; a number of other cynipid wasp galls also exude nectar. Yellowjackets and bald-faced hornets are Jekyll and Hyde wasps. During much of the season, they chow-down on soft-bodied insects such as caterpillars and sawfly larvae. Their predatory lifestyle makes them beneficial insects. However, this is the time of the year when they switch from high-protein diets to high carbohydrate diets. They can be a serious stinging-nuisance as they compete with our own high-carb consumption of soda, donuts, and certain adult beverages. Bullet gall-makers take advantage of the wasp's high-carb hankering; the nectar oozing from the extrafloral nectaries on the galls are like "wasp candy." The nectar also attracts other stingers as well as biting insects such as ants. Presumably, the close attention of stinging and biting insects prevents the immature gall-making wasp larvae located within the galls from receiving the unwanted attention of predators and parasitoids. In other words, a little sugar bribe makes the gall-home safe for the gall-maker's helpless offspring.